Relax in the brand new private Jacuzzi Living Room has brand new sectional couch with chaise, fireplace, flat screen TV and dining table with seating for 4. 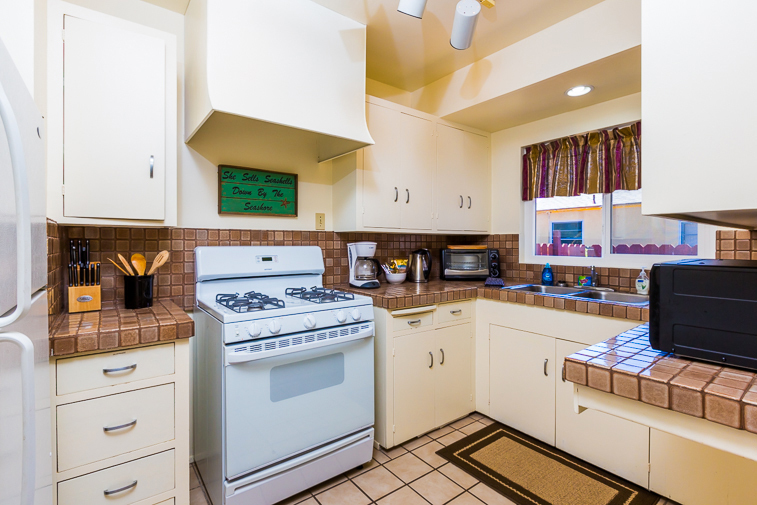 Fully equipped Kitchen has everything you need to to prepare meals. First Bedroom has a queen bed, ceiling fan and flat screen TV. Second Bedroom has a king bed, ceiling fan, and flat screen TV. Bathroom has full sized tub and shower. Enjoy a morning walk along the beach to start your day. Living and Dining areas are combined for socializing and family time. Flagstone patio with BBQ and dining al fresco for 4 people. Yard area is perfect for children and pets to play. Enjoy blue skies and sunshine with your morning coffee after a walk on the beach. 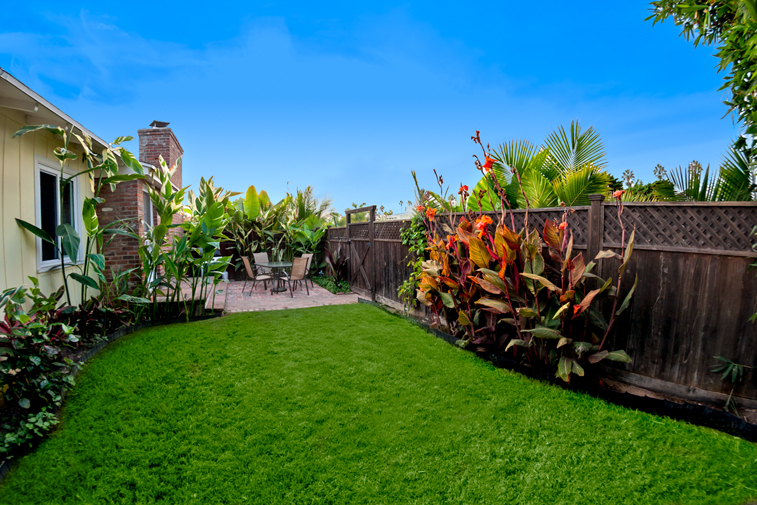 Tropically landscaped Windansea private home. 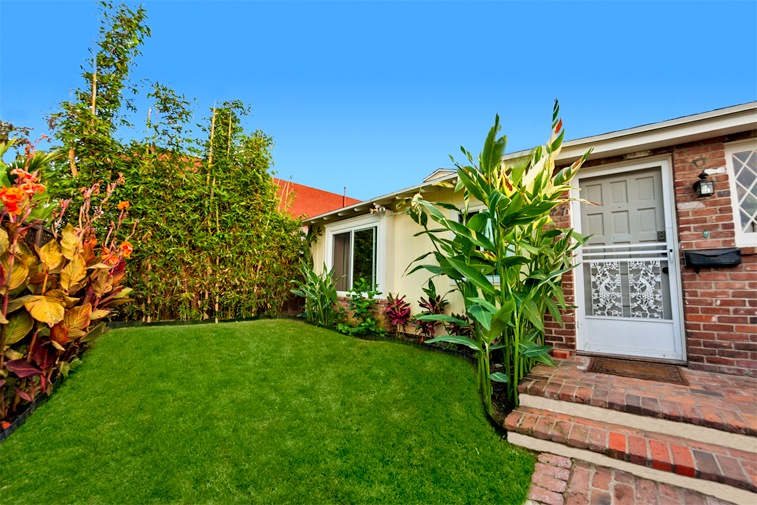 Grassy private front yard. 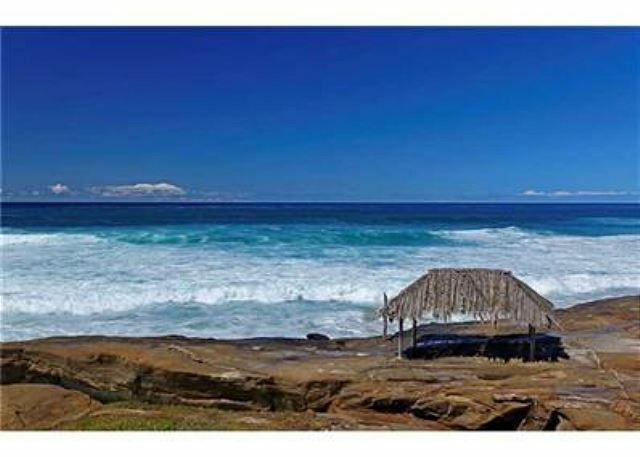 The famous surf Palapa at Windansea Beach. Windansea Beach just steps away. Looking north to La Jolla and Children's Beach (sea lions). Sunset by Children's Pool in La Jolla. Windansea Beach. Scripps Pier looking back to La Jolla. 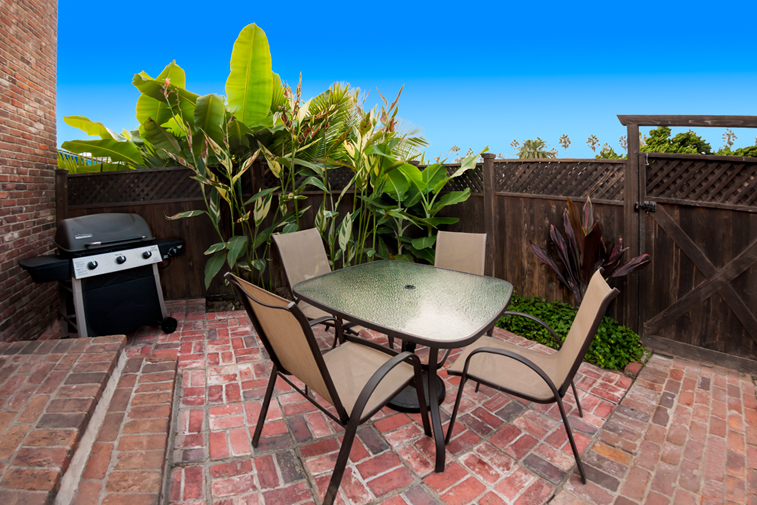 Tropically landscaped Windansea private home. 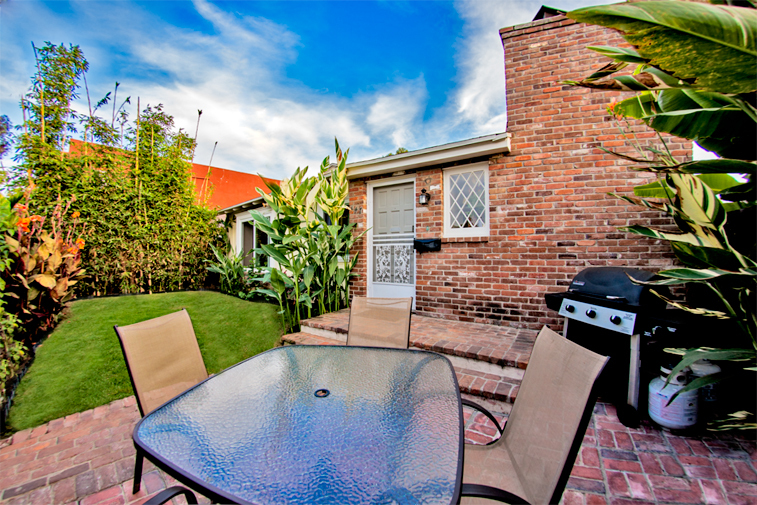 Yard area is perfect for children and pets to play. Perfect for outdoor dining. Enjoy blue skies and sunshine with your morning coffee after a walk on the beach. Flagstone patio with BBQ and dining for 4 people. 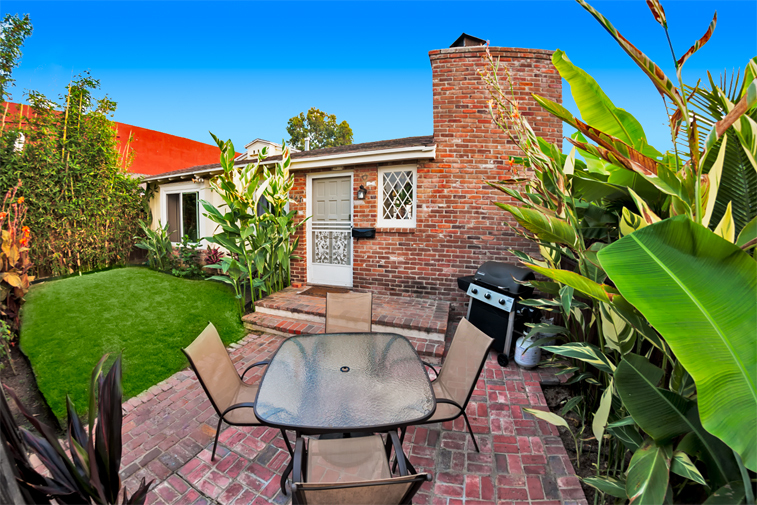 This charming cottage home just one block to Windansea Beach and within walking distance to La Jolla Village - with a large, private, tropically landscaped, grassy front yard - welcomes you to enjoy the best of seaside living! 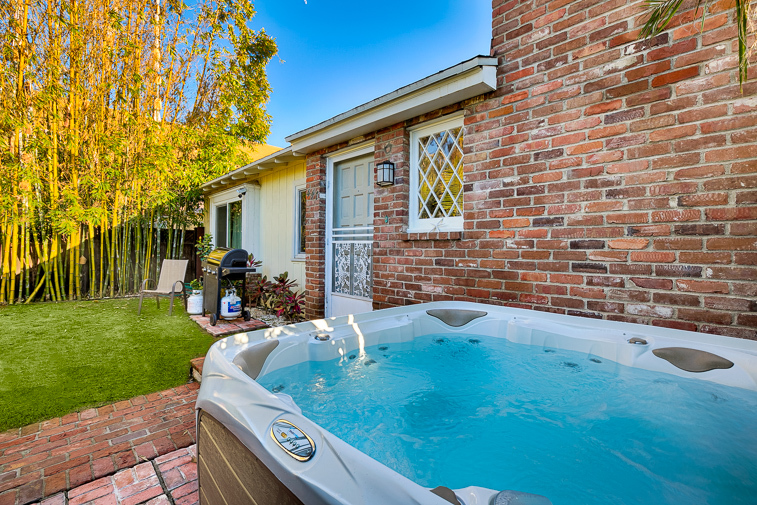 A brand new Jacuzzi in the private back yard is accompanied by a flagstone patio with a barbecue and a dining table for 4, makes it super easy to feel at home ad comfortable both inside and out. This 2 bedroom 1 bath 1,000 square foot classic California style beach bungalow with hardwood floors throughout invites you to relax and live life like the locals do. 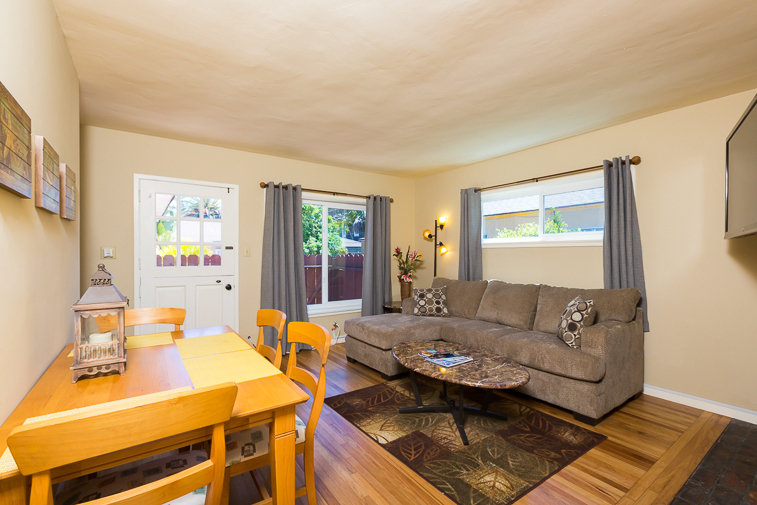 The cozy living room has a combined dining area with table that seats 4 people. The new couch has a comfy chaise lounge, fireplace for warming up on the chilly evenings, a 52 inch flat screen TV, and lot's of windows to let in the sunshine and cool breezes. A sunny, fully equipped kitchen has everything you need to satisfy your culinary desires – all you need do is add the food and the camaraderie. 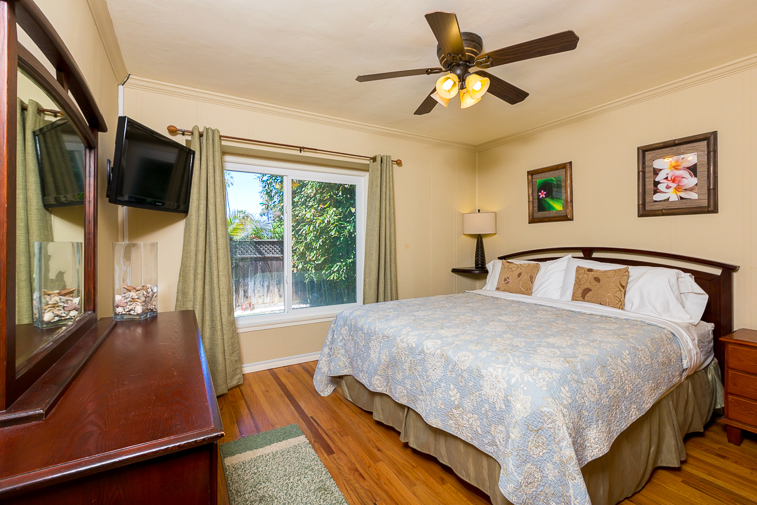 There are two bedrooms that have a flat screen TV and ceiling fans to keep you cool - one with a king bed and one with a queen bed. 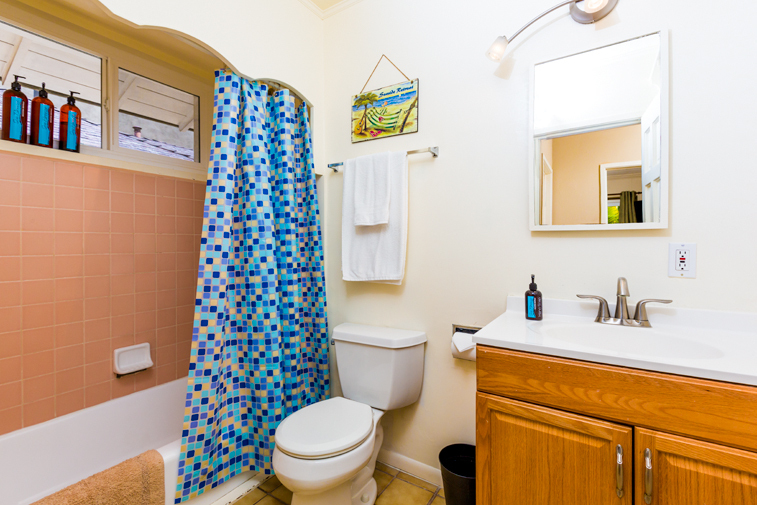 The bathroom is located adjacent to the bedrooms and has a full bathtub and shower. A large laundry closet has a full sized washer and dryer, hanging closet space, and extra storage. There is street parking only, and pets are welcome. 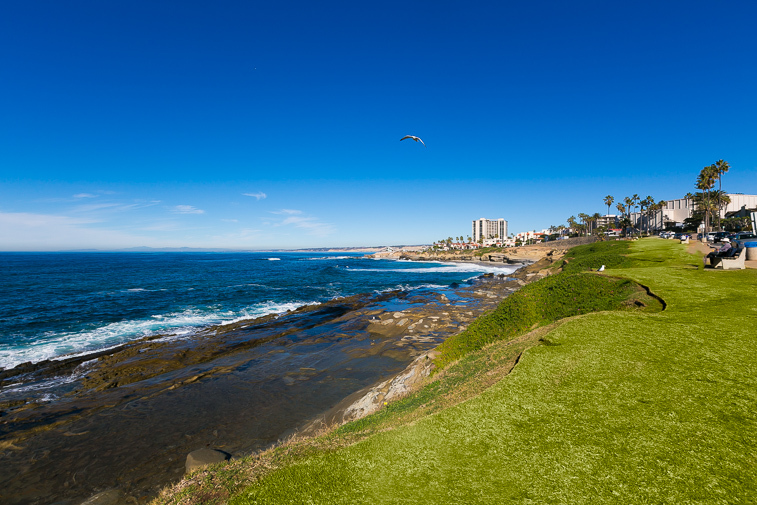 Convenient to all La Jolla has to offer, you can spend your vacation down at Windansea Beach a quick 5-minute walk down to the end of the street. 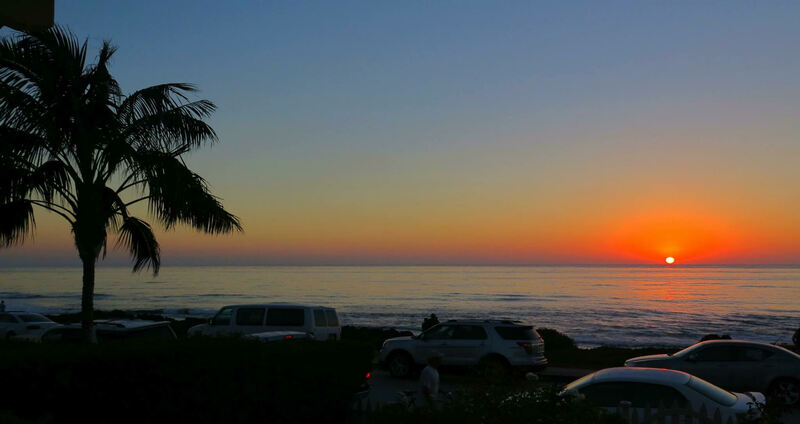 Surf, swim, sunbathe, or go tide pooling - and don't miss the famous sunsets from the bluffs each evening. 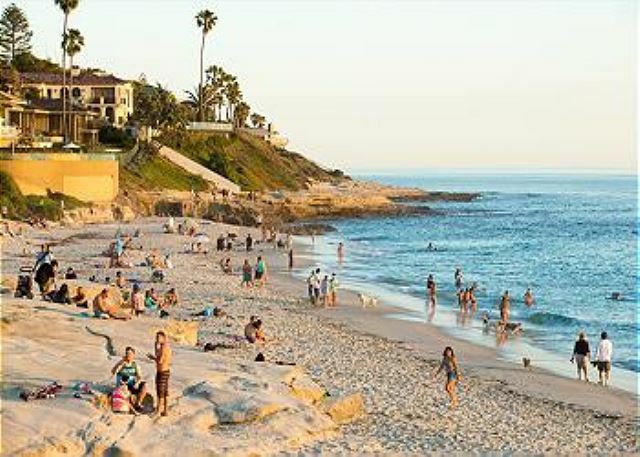 La Jolla Village with all of its world-class dining and shopping is a half-mile walk or a 3-minute drive away. 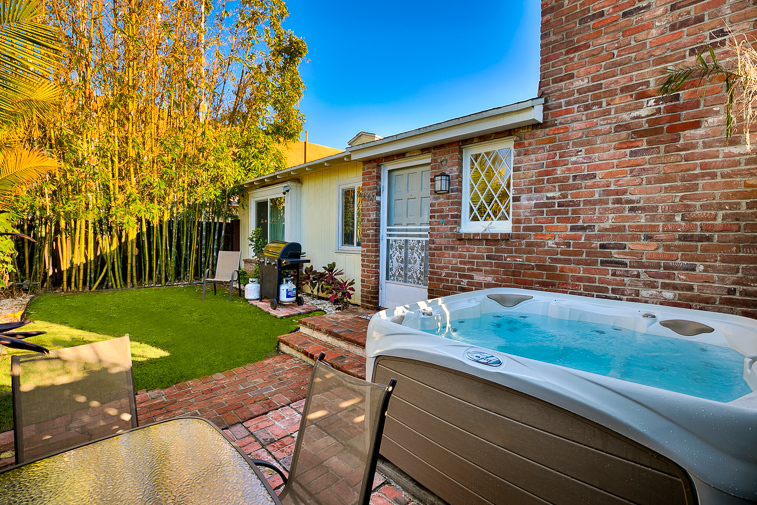 If you choose to spend your vacation here, this Windansea Fun and Sun cottage has everything you will need to insure you both a very memorable, and affordable, La Jolla vacation. 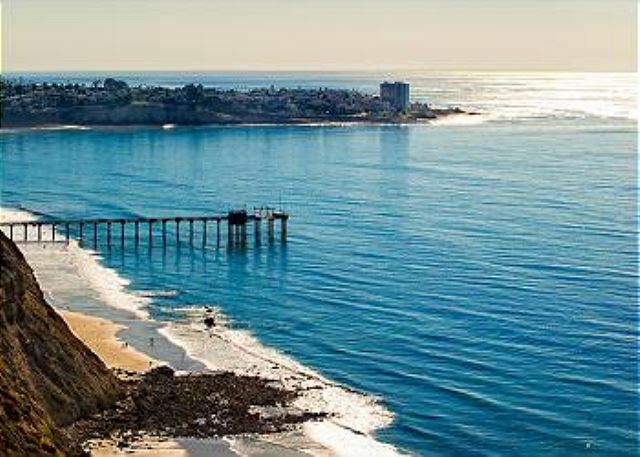 Its 1 block to one of the most beautiful beaches in the world and a 15 minute walk or 3 minute ride to world renowned La Jolla Village with all its world-class dining and shopping. With its tropical landscaping and grassy front yard you have a wonderful place for pets and children to play in between all of your adventures. 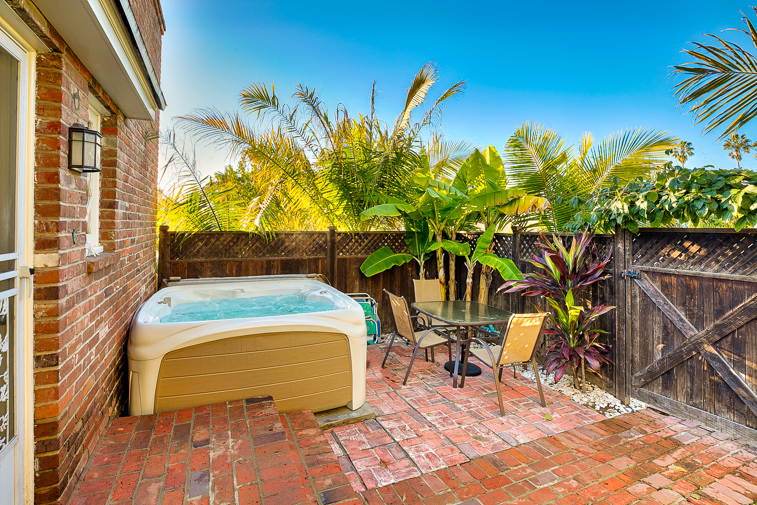 The backyard flagstone patio with a new Jacuzzi, a dining table for 4, and a barbecue is a perfect place for to enjoy your morning coffee or an evening libation. 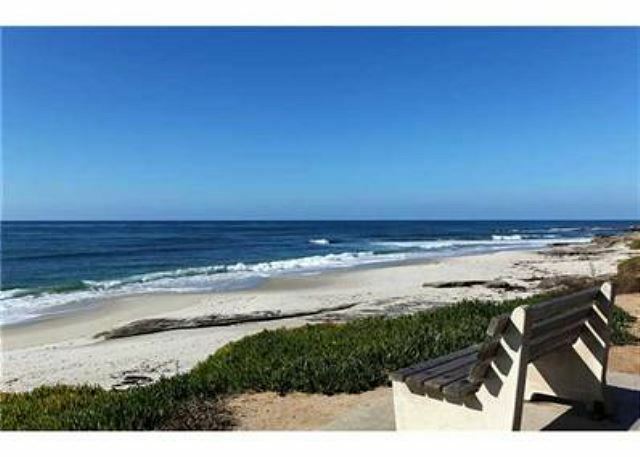 Excellent location, just a three minute walk down the street to a wonderful beach in La Jolla. We also appreciated the close proximity to town and the easy parking on the street. In terms of the space, it was reasonably clean and with nice linens in the bedrooms as well as useful cooking supplies. We enjoyed using the hot tub most nights after going for a walk, and found the fencing around the front yard provided adequate privacy. Overall a great stay! 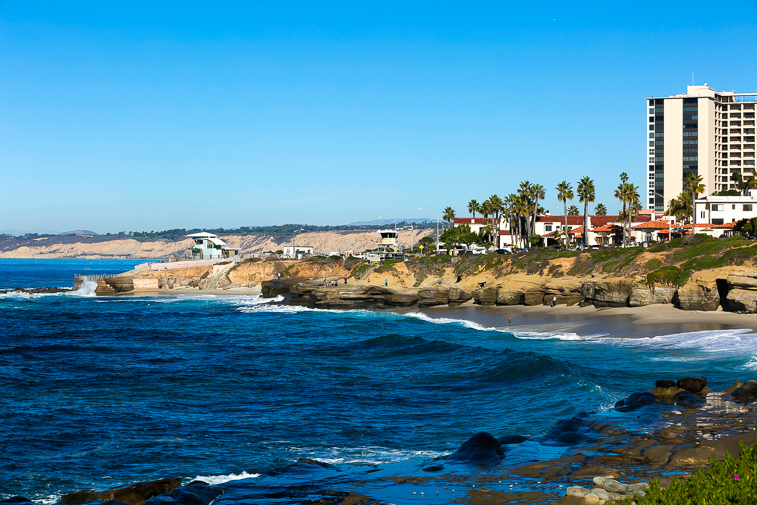 - Reviewed By Justin S.
We decided to do a vacation away from home this year as we got all 3 grandchildren for the summer, and what a better way than to enjoy the La Jolla and San Diego area with them. The property in LaJolla was perfect for us,. 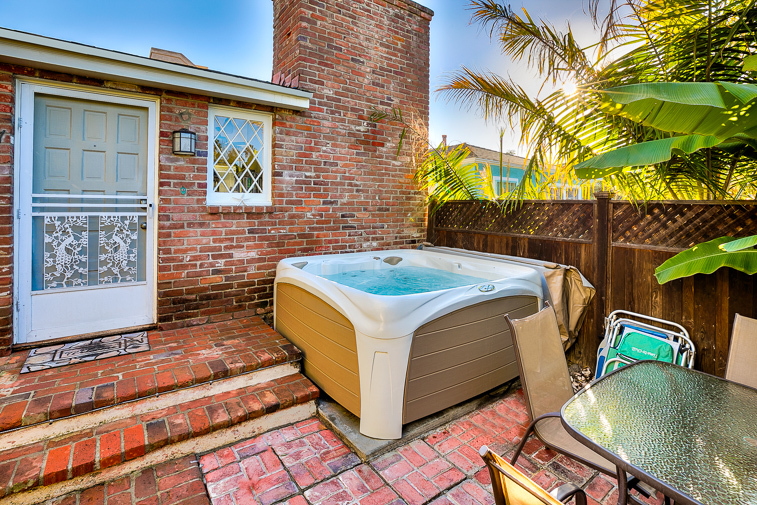 Just a couple minute walk to the beach, there was a Hot Tub at the property along with an outdoor BBQ, all the amenities you would need, a fully usable kitchen, and they are pet-friendly. We had a couple of requests from management that was handled that same day, and in the most polite and professional manner. we have already suggested This property to our friends for their vacation spot if headed to San Diego. We had lots of cool and rainy weather while we were at the cottage in La Jolla but Windandsea is now our favorite beach. The cottage was very comfortable and we parked on the street but were usually pretty lucky finding a parking spot near the front of the cottage. The fenced in yard was perfect for our yellow lab, and the area is very dog friendly. We explored local restaurants and drove around the area quite a bit, driving up Highway 101 along the coast was so beautiful. We were within 15 minutes of driving distance to family we were visiting so the location was perfect. Being less than a block from the beach and so close to all the restaurants in La Jolla was fun. My husband walked almost every day and loved being able to walk along the beach and coast to do his 4 mile walks. We would love to return, just would hope for less rainy weather! 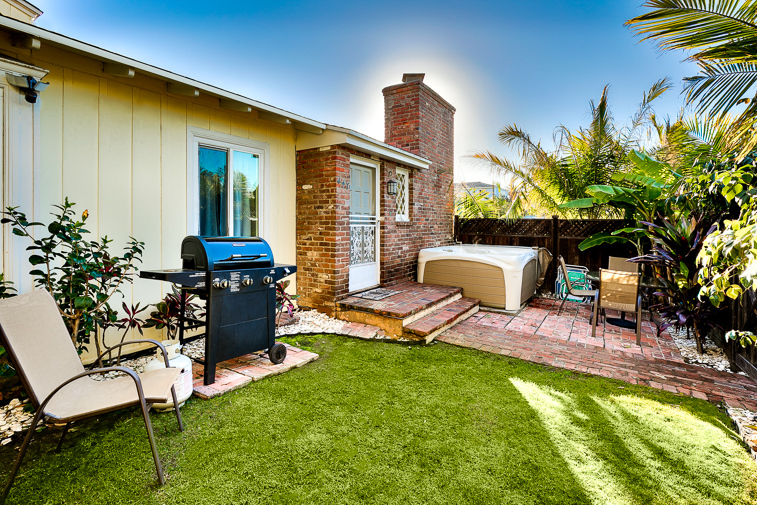 - Reviewed By Barbara R.
This vacation rental was terrific--a lovely little house with backyard, perfect for our family of 4 with two kids under 5. The washing machine was a huge plus. La Jolla was lovely--and we could walk to the beach and the ice cream store. Would come back in a flash. My wife & I, and our golden retriever spent a week here. The best thing about the home was the location. Only a short walk to the beach. And WindandSea allows dogs on the beach anytime before 9am or after 6pm, so that worked out well. Also loved the close proximity to the main drag in La Jolla. Great Mexican takeout restaurant within a 1 minute walk. Also a dog friendly restaurant that we went to on several occassions. Parking is on the street, but we never had a problem finding a place to park. The front yard was nice. 2 bedrooms & a small bathroom, which was perfect for the 2 of us, but would have been cramped if 2 couples are staying in the home. No AC, but lots of fans, and nights were comfortable. The kitchen was fine as well. Overall, an extremely nice vacation, & a place that I would recommend to friends. Our family of 5 (2 adults, 3 children) very much enjoyed our stay in this home. It was very accommodating, literally one block from the sand & ocean. The kitchen had the basics we needed. The grocery store was only a couple blocks away. The house is not air conditioned, but the fans provided sufficed great! We stayed mid-July and did not feel any heat thanks to the cool ocean breeze. Plenty of towels and sheets. 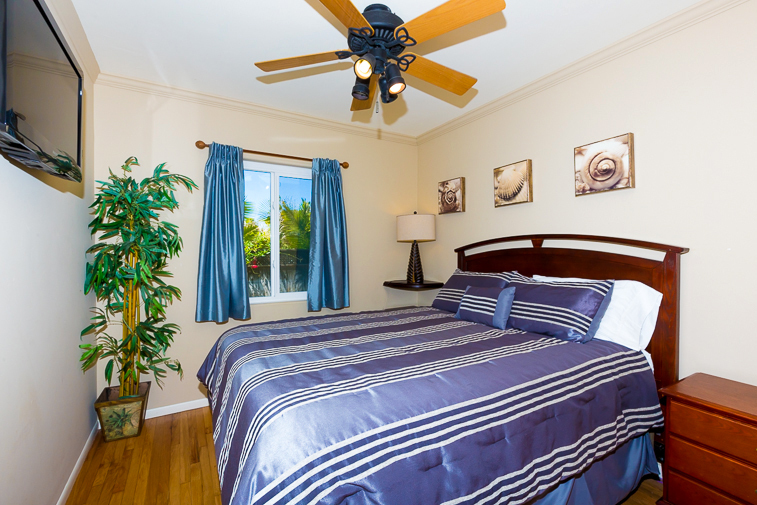 Relaxing, accommodating, and the perfect distance from one of the nicest beaches in San Diego. We would definitely stay here again. The house was in a prime location for us, we enjoyed the beach and local restaurants in the area. The front yard gave us plenty of privacy as we enjoyed the plants and patio seating. The inside of the house was very tidy and everything we needed was there. We enjoyed staying at Windansea cottage. The beach is close by so it is easy to alternate lazy beach days with busy sightseeing days in San Diego. The tropical plants and the bamboo hedge make the garden very pleasant. It is amazing how a small yard can be turned into a truly refreshing spot. This beach cottage was the perfect choice for our vacation. It has the look and feeling of a fun and open beach house. To start out, the whole process of booking the property and getting access to the house was a breeze. The home was clean and inviting which made us feel really comfortable. It was decorated in a very up to date and comfortable way that made us feel like we were at home. Our favorite part was being able to relax in the backyard. Having a BBQ was a great feature and having dinners our there was nice. The 5 minute walk to the beach was more than we could have asked for. It made for the perfect beach vacation. We had so much fun. We had a lovely stay in this little comfy house. The only recommendations I would make to improve it is to add an additional comfortable chair in the living room and another floor lamp. We are readers and both had to sit on the sofa with the floor lamp across the room. There would not be enough comfortable seating with more than two adults. Also - add some kitchen towels. There were plenty nice bath towels but only one kitchen towel. The bed was very comfortable!!!! We had a great time staying at this cottage down the street from the beach. Overall, our stay was quite comfortable. However, at the time of year that we stayed (all of September) we experienced a humid period. The house was not air conditioned and I believe that point was left out of the description [I could be wrong on this]. All efforts were made to make the home more comfortable by providing us with a room fan. This helped quite a bit. The weather cooled off mid-Sept. Whatever our need, it was promptly provided by Tim, of Seabreeze. Most importantly, the location was Super. A short walk down the street and you arrived at the beautiful Sand and Sea beach. We really enjoyed our stay here and are already talking about renting again next year. 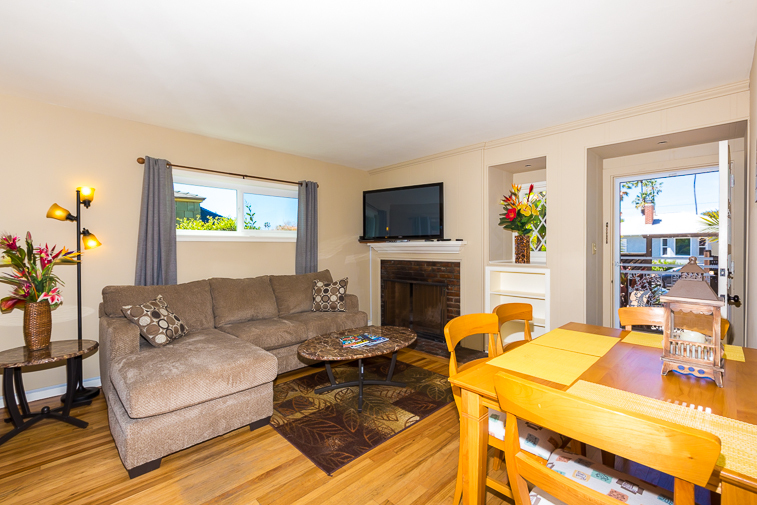 The house is in a perfect location as it is just a short 3-5 minute walk down to Windansea Beach. The beds were comfortable, the linens and towels practically brand new, the kitchen was well stocked with everything we needed, and we really enjoyed having a TV in each bedroom as well as the large TV in the living room. We also spent a lot of time in the front patio cooking our dinner on the BBQ while our dog enjoyed the yard. All in all a great experience and we can't wait to come back. Thanks SeaBreeze! The property was great. We have a family of five with three grown children. We were very comfortable, but there was no pull out sofa bed just a narrow couch to sleep on. The beds in the bedrooms were very comfortable. However, in the laundry room it was a bit hard to turn on the light. We had to reach up and pull the cord. We are fortunate because we are tall. Overall, it was wonderful. We would recommend it. We drive to San Diego a few times every year and are so happy that we found this house. 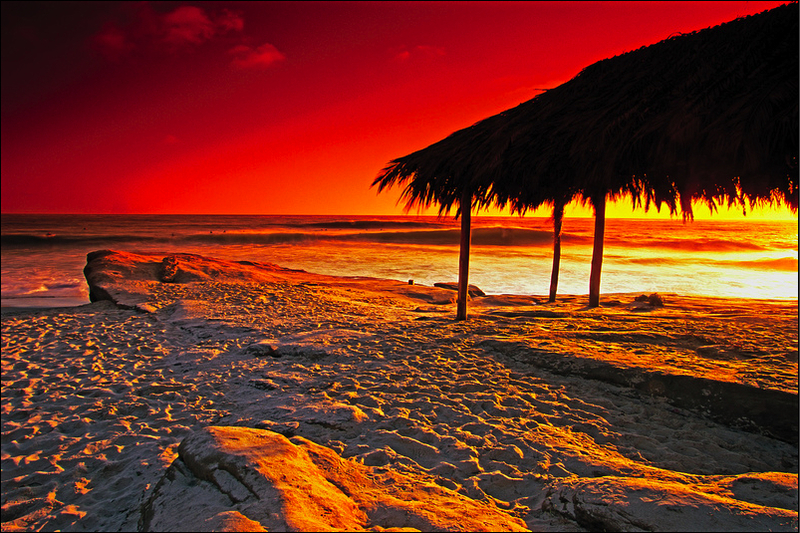 It is located just a short 3 minute walk down to Windansea Beach, which is now our favorite beach in San Diego! So beautiful and fun to watch the surfers ride waves all day. Much less crowded than a lot of the other beaches we have been to as well. As soon as we walked in, we could tell that the house had just been professionally cleaned and everything that we needed was there. We literally dropped our bags off and immediately started our vacation. The beds were very comfortable and we loved the large TV in the living room and the fireplace. The large fenced in and private yard was perfect for our dog and we had a few really nice afternoon BBQ's there as well. We plan on renting this house every time we come back. Not knowing anything about La Jolla the location could not of been more perfect. Windnsea beach was by far my favorites which is just a few blocks away. A nice walk into town with lots of resturants and shops. I would come back and stay at this location again. Great location. Barely 300 yard walk to the beach. 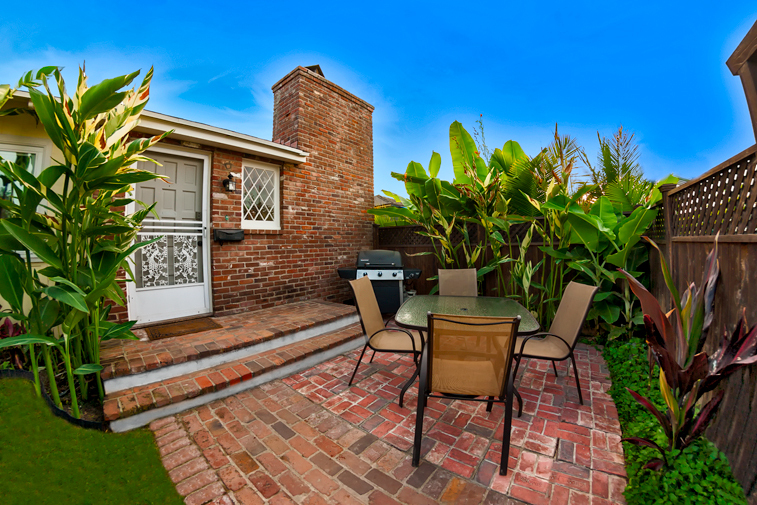 Close to great restaurants in La Jolla. Beautiful place! Excellent vacation, cute house. Only thing I would suggest is a chair in the living room. Great rental, close to everything including the beach. the only negative was the bathroom tub which was in need of replacing. Everything else was top notch. Great place to take your dogs, secure front yard, nice landscape and good for BBQ. TV's all worked and made nights relaxing and comfortable.